On the one hand, as the Times points out, Obama "has warned that Iran is not open for business." Due to complicated trade rules, the Commerce Department would have to grant clearance for the private jet's General Electric engine to touch Iranian ground. But then again, there are still "a few United States and European business activities" currently permitted. Even some former federal officials, who spoke on the condition of anonymity, said the very presence of an American-flagged aircraft parked in broad daylight suggested its flight had been approved as part of a legitimate business trip. What is more, they said, the easily identifiable plane was not likely to be part of a covert diplomatic mission. Then there's the question of was in the plane. Airport officials said only that the passenger was a VIP, and the Iran UN Mission referred reporters to the plane's owner. Which turns out to be a bank, since the plane is held in a trust by anonymous investors. 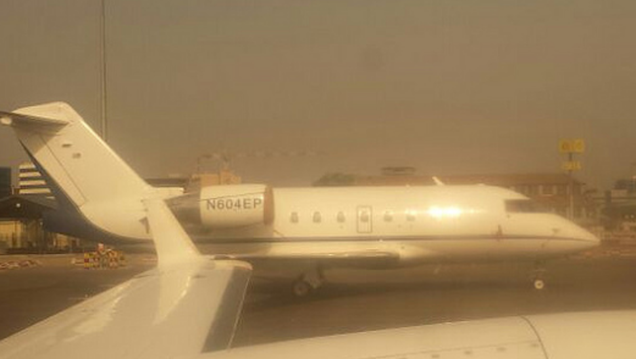 Still, the tail number was recorded in Zurich around the time of the World Economic Forum and spotted in Ghana last October (pictured above). A Bank of Utah executive said his bank, the trustee for the plane's investors, had no idea the aircraft was in Iran. The Bank of Utah, which is listed as a trustee for more than 1,000 planes, plans to resign should evidence of illegal activity arise.